Delivering Kosher? Use Kosher Tape Plus! Kosher Tape being used to seal pizza boxes for EJ’s Pizzeria in Skokie, IL. If you are a kosher restaurant that delivers, you know that special care must be taken when preparing food for transit. If you use Uber Eats or another third party delivery service, you know that an even greater level of care must be taken because you will not be the one personally handing over the food to the customer. For food to be certified kosher, it must remain securely sealed from the time it leaves the packing facility (in this case, the restaurant) to the time it arrives in the customer’s hands. When using an outside delivery service however, you can never be quite sure what happens to the food along the way! That’s why sealing kosher meals is so essential, especially for delivery. Most establishments focus mainly on function over aesthetics when sealing their products – as long as there is a secure hold they are set. But at Kosher Tape Plus, we believe in going the extra mile. Tape should keep your kosher products sealed AND make a statement. That’s why we pride ourselves in creating custom-printed tapes with your company’s logo, contact details and the symbol of the certifying kosher organization. Unlike plain tape that will be removed without a second thought, Kosher Tape Plus’ tapes will leave a lasting impression on the consumer and spread brand awareness. Uber Eats. Their coworkers smell the delicious aromas and glance over to see where the food is from. They see your company logo looking bold and crisp on custom-printed tape, and you’ve just gained a new customer! 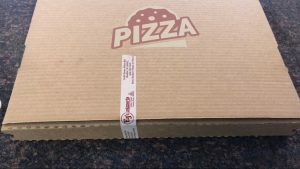 Keeping food sealed is imperative for kosher restaurants, especially those that deliver or use delivery services. Stand out from the crowd of plain, generic tapes with custom-printed tape from Kosher Tape Plus.